Calculating formal charge is one of the most important skills you have to master in your organic chemistry course. At first you’ll simply calculate which atom on a polyatomic ion carries charge. But as you get into more advanced reactions you’ll be using formal charge to identify reactive intermediates and reaction patterns. The standard formal charge formula covered in your text is lengthy and confusing. This video shows you my formal charge shortcut which takes just a few seconds once you get it. This is Video 4 in the Orgo Basics Video Series. Click HERE for the entire series. 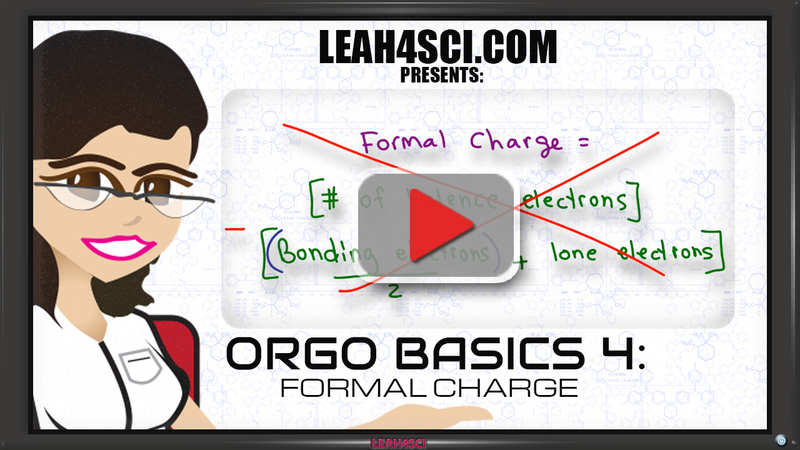 Don’t miss the Written Tutorial Formal Charge Formula and Shortcut for Organic Chemistry that is also apart of the Orgo Basics Series. I’m an AP chem teacher and always looking for new videos for my students. These are great for bonding and molecular geometry. Thanks, Andy! Glad to help you with your students! Feel free to email me anytime! I am from india, you are a genius really genius . great teacher indeed. Great video on formal charges – it makes sense now!